In the wave energy world, progress means having "steel in the water." Now that gadgets are graduating from mere prototypes to pre-commercial machines, their engineers must find the best places to try them out in the open ocean. "You can learn a lot in the lab, but in order to prove commercial viability, you need to prove ocean viability," said Justin Klure, a partner at Portland, Ore.-based Pacific Energy Ventures who consults on the Azura wave energy device. The 45-ton "Azura" went into the water in early June at the U.S. Navy's wave energy test site, near Kaneohe Bay off the coast of Oahu, Hawaii. Pre-existing test facilities like that allow developers to skip some steps and deploy their machines so they can see what works and what doesn't. They don't have to find a site or get all the permits themselves. During a yearlong trial run, Azura's parts will move up and down and side to side with the waves. The relative motion feeds a generator, which sends electricity back to the grid through an undersea cable. Seeing the device start swaying with the waves was a "eureka moment" for Steve Kopf, the CEO of Northwest Energy Innovations, which is developing Azura. It is the first time a third party, the University of Hawaii, is validating the data coming from a wave energy device. The country's waves are a huge, untapped energy source. On the coasts, including Alaska, waves could provide enough recoverable energy, around 1,170 terawatt-hours per year, to power almost 100 million homes, according to estimates from the Department of Energy. The West Coast offers a quarter of that potential. With its energetic waves and populated shores, it's a promising market for wave energy dreamers. But for now, the dream is still far off. For Azura, surviving the Hawaiian waters will be a first step, allowing engineers to tweak and update it for better performance. To make sure it is ready to sell electricity to utilities, it will have to run in a wave energy farm. That setup doesn't exist anywhere in the United States -- for now. Two groups, in Oregon and California, are preparing plans for utility-scale, grid-connected test facilities. They are larger than the Hawaii facility, which already has four devices lined up for prototype tests in the upcoming years. "Steel in the water": Azure, which makes electricity from the motion of the sea, settles into her Pacific home in Hawaii. Photo by Steve Kopf, courtesy of Northwest Energy Innovations. The Department of Energy will choose one of the project sites at which to fund construction, as per its 2016 budget request, according to an emailed statement. Europe, generally ahead on marine renewables, already has a few test sites, notably the European Marine Energy Center off the coast of Scotland. Now, the United States is trying to catch up. No one is really sure what the technology will look like in 10 or 20 years. "We haven't settled yet on a standardized technology, which is why we need to have several in the water and build our familiarity in the technology," said Jason Busch, director of the nonprofit Oregon Wave Energy Trust, which supports the wave industry in the state. "We don't have our three-bladed wind turbine yet." There are point-absorber devices, like Azura. They have generators that turn the relative motion of their parts into electricity. Some focus on the heave, or up and down, of the waves; some on the surge, or back and forth. The other main type is called an oscillating water column. The movement of the waves pushes air back and forth in an inner chamber, spinning turbines to produce electricity. Engineers overflow with ideas. In late May, the Department of Energy launched a $2 million competition called the Wave Energy Prize. Ninety-two teams have applied. The top designs will be announced in mid-August. Few companies are in it for the long haul. Only around a dozen companies are "throwing serious money" at wave energy, said Busch. The recession, the limited funding and the difficulty of ocean engineering dried up many enthusiastic early developers. "It's what happens in every industry: Smaller companies or more ineffective companies are just not making it," Busch said. "It's a natural process." Specialization, he thinks, could be the way for the industry to grow. "You could talk about deep-water technology, shallow-water technology, different levels of energy in the ocean," Busch said. "Technology that would be appropriate off the coast of Oregon would look different than technology powering communities off Alaska or Caribbean or Hawaii." Small, remote coastal towns or Navy bases who already pay expensive utility bills and would require only one or two devices could be the best place to launch wave energy, some experts have said (ClimateWire, May 9, 2014). For now, the main force behind the new marine technology has been the Energy Department. It has poured $47 million into wave energy projects since 2008, according to an emailed statement. The industry at large has not weaned itself off the drip-by-drip federal funding yet. That means both test-site developers and device engineers are sputtering ahead in uncertain starts and stops. "There's not really enough funding to get everything going at the pace that people would like it to get going," said Belinda Batten, who leads the Northwest National Marine Renewable Energy Center (NNMREC) at Oregon State University. "It's this big bundling conundrum right now." 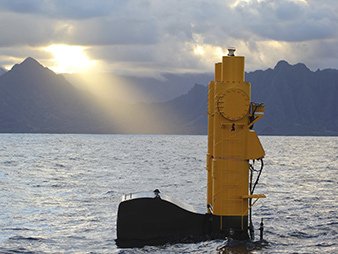 Oregon has led the rest of the country on wave energy development. Since 2012, NNMREC already operates a small non-grid-connected testing station off Newport, Ore. Multiple devices, including a previous version of Azura, have already been tested there. A second facility, called the Pacific Marine Energy Center's South Energy Test Site, is one of the candidates for full funding by the Energy Department. The site could have four individually grid-connected berths, at which developers could test single devices or an array of devices. If she had all the money she needed today, the site could be online in 2017, Batten estimated. That more or less syncs up with when developers could be ready to test an array of devices. Azura could be there in 2018 or 2019, according to Kopf. The other potential test site, in California, is just starting out. The state offers a more pricey and larger electricity market. The CalWave project, led by California Polytechnic State University, would be located off the coast of Vandenberg Air Force Base near the town of Lompoc in Southern California. For now, Bill Toman, the project's leader, is using an initial $750,000 Energy Department grant to figure out how a test site could work. The full feasibility study could be out later this month, he said. The facility could include four testing berths, including potential connections for floating offshore wind turbines. There's a pre-existing undersea water cable nearby that already connects an offshore building platform to the grid, which could avoid additional construction costs. Being able to plug in to existing infrastructure could make a difference for wave energy developers, he said. Installing cables and moorings in ocean conditions can be tough and expensive (Greenwire, Nov. 11, 2014). Another obstacle to establishing the open-water facilities is the lengthy permitting process. Dozens of local, regional and federal agencies must give their stamp of approval. A promising grid-connected project by Ocean Power Technologies Inc., a Pennington, N.J.-based wave energy company, had to fold last year in part because of the costs accrued during permitting (ClimateWire, May 8, 2014). Ask Dan Hellin, who's in charge of testing at the NNMREC in Oregon, about slogging through the permits there, and he chuckles. But he's optimistic that the process will get easier with time as more deployments carve an increasingly familiar path. That's also why Azura is important. The University of Hawaii's Hawaii Natural Energy Institute is studying Azura's environmental impacts, like those on wildlife or sediments, on a federal grant. "Given how few deployments there have been in the world, it's at least scratching the surface," said Patrick Cross, one of scientists doing the research in Hawaii. "It's giving the regulators who have to sign the license more information to make them more comfortable."